Rep. Lieu on Kellyanne Conway: White House Should Not Be Used for Enriching the President’s Family | Democracy Now! The Office of Government Ethics says counselor to the president Kellyanne Conway committed a “clear violation” of federal ethics rules when she used a TV appearance on “Fox & Friends” last week to market merchandise sold by President Trump’s daughter, Ivanka. Her endorsement of Ivanka’s products came after Trump tweeted from his official government account blasting Nordstrom for dropping Ivanka’s product line. Trump is also facing a lawsuit alleging he is in violation of the Constitution’s Emoluments Clause for his foreign conflicts of interest. For more on these conflicts of interest, we speak with California Democratic Congressmember Ted Lieu. AMY GOODMAN: Then you have his counselor, Kellyanne Conway. Can you comment on this latest news of the Office of Government Ethics saying she violated the law, that the counselor violated the law, the federal ethics law rules, when she used a TV appearance on Fox to market merchandise sold by President Trump’s daughter Ivanka? She actually was following up on President Trump using his POTUS account to castigate the department store Nordstrom from Washington state for dropping the Ivanka line. REP. TED LIEU: I can’t even believe that I have to say this, but the White House shall not be used for the purpose of enriching the president’s family. That is just basic common sense. But it’s also federal regulation. So the federal regulations say that federal employees cannot promote or endorse a product, such as Ivanka’s product line. Kellyanne Conway did exactly that. She violated the federal regulation. It’s very clear. Last week, I wrote a letter to the Office of Government Ethics asking them to take action. Very pleased that yesterday they wrote a letter saying that the White House needs to investigate and discipline Kellyanne Conway. I hope the White House does that. AMY GOODMAN: And what about President Trump? Actually, she was just defending him. He used the government, tax-funded—taxpayer-funded account, his Twitter account, his POTUS account, to retweet this comment about going after Nordstrom’s, who said they made this decision because it, you know, wasn’t financially working out for them. REP. TED LIEU: Donald Trump has, in many instances, placed America second and placed himself or his family first. That is wrong. But in addition, this is more evidence that Donald Trump has vast amounts of conflicts of interest, both in the United States as well as globally. And the United States Constitution says you can’t actually have these foreign conflicts of interest. It’s known as the Emoluments Clause, Article I, Section 9. Donald Trump is in violation of that clause, because he has all these global business holdings all across the world, and he’s getting payments and gifts from these foreign countries and foreign entities. That’s why I’ve created an illegitimacy clock. It’s on my website. If you look at it, it tells you how many days and hours Donald Trump has been illegitimate as president because he’s in violation of our Constitution. AMY GOODMAN: So, who should be investigating this right now, all of this, particularly what—you know, the top news, what Michael Flynn knew, what President Trump knew, most significantly, when he knew it, and what were these contacts that have been going on for a long time? REP. TED LIEU: Congress should be doing this. Unfortunately, the Republicans control the House of Representatives. I believe in 21 months Democrats will take back the House, and then we will investigate. 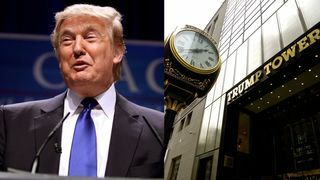 In addition, there are now lawsuits being filed against President Trump for his violation of the Constitution and the Emoluments Clause for his foreign conflicts of interest. Now, keep in mind, Donald Trump can resolve some of this just by disclosing his tax returns. Then we’ll know: Does he have special business holdings in Russia, that we know about, or in other countries? So, for example, with the Muslim ban that Donald Trump instituted, if you read it, the very first paragraph says the purpose of that ban is because of 9/11 and the horrific terrorist attack. And then they ban seven countries that had nothing to do with 9/11. They don’t ban the countries that did have something to do with 9/11. And is that because Donald Trump has business interests in those countries? I don’t know. But if he would disclose his tax returns, then we would know if that’s really the case.